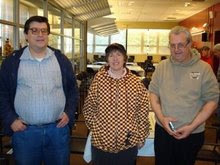 Last night, I won the following game at the Marshall Chess Club. 26.Nc3 Rab8 27.Nc6 Rxb2 28.Ra1 Bd2 29.Na4 Bxe1 30.Nxb2 Bc3, White resigns. 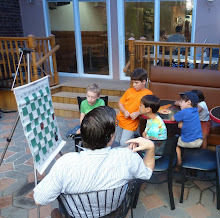 Yesterday I drew this game at the Marshall Chess Club. 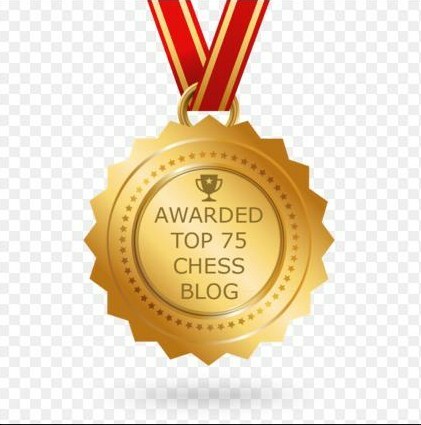 50.h4 gxh4 51.gxh4 h5 52.Bf7 Bd4 53.Kh3 Bf2 54.Be6 Kf4 55.Bf7 Ke5 56.Be6 Kf6 57.Bd7 e5 58.dxe6 Ke7 59.Ba4 Kxe6 60.Bd1 d5 61.Bxh5 d4 62.Bd1 Kf5 63.Be2 Ke4 64.h5 Be3 65.h6 Bxh6 66.Kg4 Ke3 67.Ba6 d3 68.Bxd3 Kxd3, draw. 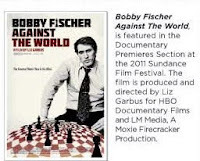 Filmmaker Liz Garbus is interviewed on Bobby Fischer Against the World. Here are film reviews of Bobby Fischer Against the World from NBC, Variety, Daily Film Dose, Box Office, and Hollywood Reporter. 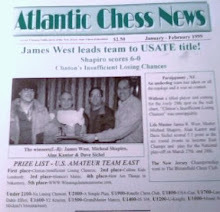 In the April-September 2010 double issue of Atlantic Chess News, my article on misplaying a rook-and-pawn ending appears on page 35. 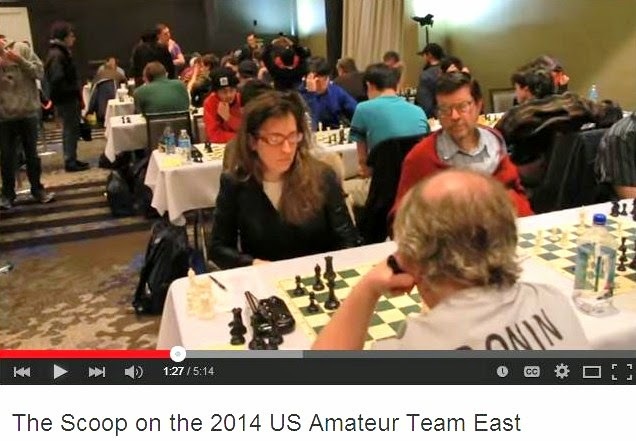 Lev Zilbermintz's analysis of the Newark Gambit can be found on pages 25 to 30. 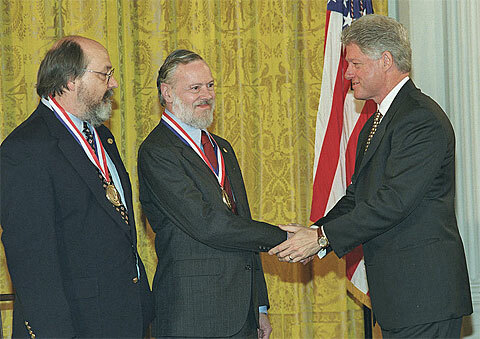 Ken Thompson and Dennis Ritchie [pictured, with Bill Clinton] have been awarded the 2011 Japan Prize for information and communications. 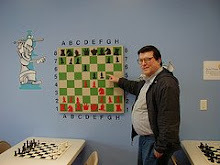 While working at Bell Labs in New Jersey, Thompson developed the first chess playing computer Belle, which won the world computer chess championship in 1980. In a 2012 exhibition, an Australian museum will honor the career of Heath Ledger [pictured with Ellen Page], including his "formidable abilities as a chess player." "NY Times" Review of "Endgame"
In today's issue of The New York Times, Janet Maslin reviews Frank Brady's Endgame. At today's quads in Hamilton, I drew all three games. 36.Rbc1 Rxc7 37.Rxc7 Nxc7 38.Rxc7 Rd4 39.Rd7 h5 40.h4 Kf8 41.Kf2 g6 42.Ke3 Rg4 43.Kf3 Rd4 44.Kf2 Rd3, draw. 36.Bd4 Bh3+ 37.Ke1 Bh4+ 38.Kd2 Bf5 39.Kc1 Bg3 40.Kb2 Bg4, draw. 16.Nxe7+ Qxe7 17.Ne2 Nxe2+ 18.Qxe2 f5 19.exf5, draw. 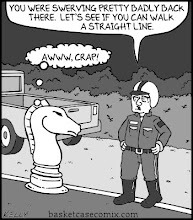 A playoff game in pro football is often referred to as a chess match. Before the Jets - Steelers game on Sunday, CBS will air a segment that compares a football game to a chess match between two grandmasters. The technical advisor for the segment is international master Marc Arnold [pictured]. Here is a press release on IM Dean Ippolito's attempt to set a Guinness world record for simultaneous exhibitions. 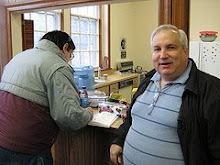 Sundance Film Festival @ "CLO"
At Chess Life Online, Jennifer Shahade writes about Bobby Fischer Against the World at the 2011 Sundance Film Festival in Utah. 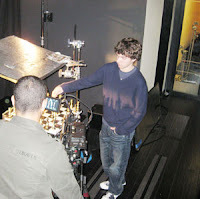 The documentary film, directed by Liz Garbus, will air on HBO this summer. The documentary film Bobby Fischer Against the World, directed by Liz Garbus, will be playing at the 2011 Sundance Film Festival. 21.fxe5 Rc8 22.Qd5 Bc5 23.d4 Be6 24.Qe4 Ba7 25.c3 Qc7 26.Nf4 Bd7 27.Nd5 Qd8 28.Nf6+, Black resigns. 56.Kd4 Ne4 57.g4 Ng3 58.gxf5 Nxf5+ 59.Ke4 Kd7 60.Kf4 Kc7 61.h5 a4 62.hxg6 hxg6 63.Kg5 Ne7 64.bxa4 Rxa4 65.b3 Ra1 66.Nd4 Rf1 67.Ne6+ Kc8 68.Nf4 Kc7 69.Ne6+ Kc8 70.Nf4 Kc7, draw. 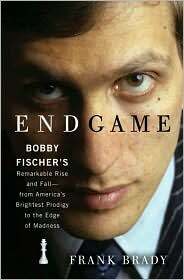 I have received my finished copy of Endgame by Frank Brady. Unlike the uncorrected proof, from which I reviewed the book, the finished copy has a section with many photographs that have never been seen before by the general public. Yesterday I spent nearly an hour looking at them, again and again. 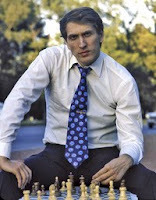 The idea that Bobby Fischer was alienated from his mother Regina is debunked by these photos. We see a snapshot taken by his sister Joan which shows young Bobby sleeping on the subway, head resting on his mother's shoulder. In another picture, Regina in disguise visits Fischer in his hotel room during the 1972 match in Reykjavik. Before becoming obsessed with chess, pre-teen Bobby dreamed of becoming a professional baseball player. One photo shows him batting at the plate, during a grade school game in Brooklyn. There are also shots of Fischer with Mayor John Lindsay on Bobby Fischer Day, and of the much older Fischer walking down a country road in Iceland. My favorite picture is the one of Fischer, at the Marshall Chess Club in 1965, talking on the phone with Smyslov after defeating him by teletype. Quentre is an exploresome foursome, New York freelancers who came together because of their love for playing musical literature, both new and familiar. Members Jim Ferraiuolo on oboe, Brenda Vincent on violin, Denise Cridge [pictured] on viola, and Deb Spohnheimer on bass have delighted audiences in downtown art venues and rococo halls alike. 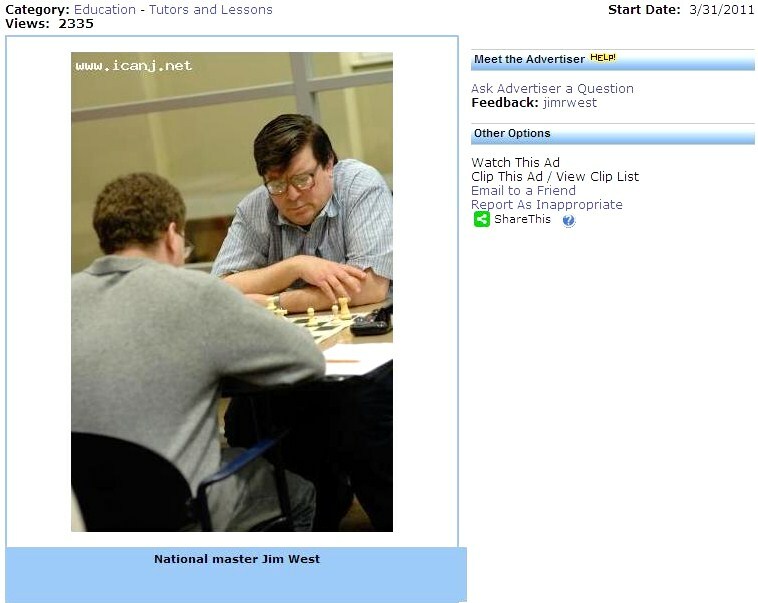 Jim Ferraiuolo is also a member of the Marshall Chess Club. 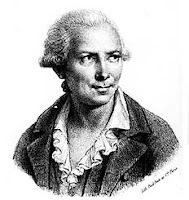 At Contre Gambit Philidor, Frederic Fournier provides a link to the game DePalma - Zilbermintz in the Newark Gambit. 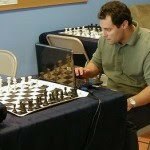 You can listen to audio clips by author Frank Brady from his upcoming book Endgame. 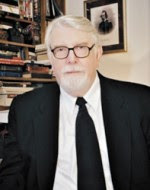 In addition to book signings in New York, Dr. Brady will sign copies of his book at the Hilton Parsippany in New Jersey, during the USATE on February 20th at 5pm. 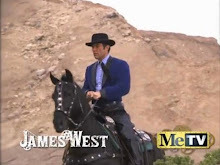 Publishers Weekly interviews Dr. Frank Brady [pictured] on Bobby Fischer, who is the subject of Brady's soon-to-be-published Endgame. 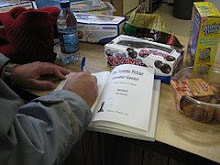 Here is another book review, or two. 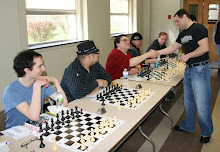 The winner of quad one in Westfield on Sunday was Alice Dong with a score of 2-0-1. 30.Ba2 Ba6 31.c4 Kg7 32.Qc3 Re8 33.Bb3 Bb7 34.Bc2 a2 35.Qb2 a1=Q 36.Qxa1 Qxc4 37.Qd1, draw. Cohen - West @ "Contre Gambit Philidor"
William Nack Article on Fischer in "SI"